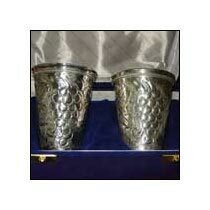 We are a leading Manufacturer, Exporter, and Supplier of Silver Glasses, located in India. They are offered in different sizes, shapes, and designs. Our Silver Glasses have a perfect finishing and shine. Easy to grip and unbreakable in nature, our glasses are quality tested in compliance with the set industry guidelines. Silver Glasses look elegant and classy. They can be availed at market leading prices.